« I do not accept this. imagine this hanging over you. just think about it. Sounds to me like some of you ladies are lacking in certain aspects of your spousal relationships. Scott, the jealousy was oozing from your fingertips as you typed your post. Next time, don’t bother. Your ignorant comments aren’t necessary. Unfortunately, Sexhair has an undisclosed injury and is day-to-day right now. I hope we don’t have to wait much longer to see him back on the ice. PA Girl…ummm….not really. I’m happily married to my smoking hot wife and mother of my wonderful son. Do y’all swoon for greaseheads like Pattinson too? What IS it with chicks and the “I haven’t washed or combed my hair for a month” guys? And yes, I still have plenty of hair, thanks for asking, no jealousy here. Not much. Nope I don’t like hair. I’m all for the close cut or bald heads. Yum. Lisa who is HAPPILY married, but still appreciates a totally sexhair man!!! And his smile is pretty darned cute too!! Why is it that whenever a married woman says she finds someone attractive, it means she isn’t getting satisfaction from her husband? I think Mike Wallace is hotter than a baker. That doesn’t mean my husband isn’t doing it for me. @Scott #5 – Does the mother of your son know about the smoking hot wife? @bucdaddy #6 – Who says he doesn’t wash his hair? You are aware that hockey players tend to warm up and get all sweaty before the game, right? Well said, oldgraymare. The jealousy is dripping of my computer screen. You wouldn’t be dogging anyone if a hot pic of a half naked woman was put up. *you guys wouldn’t be dogging anyone. Sure am. Saying it looks sweaty and drippy in that photo, though. Saying if you saw a guy in that exact posture and with that exact hair sitting on a street dahntahn with a cup in front of him, or ranting on a corner about how you should repent, then “Sexxxxxaaaay hair!! !” might not be the first thing that comes to your mind. Was that supposed to be funny? Don’t disrespect my wife, even if you’re trying to make a joke. Learn how to express your point more clearly. Also, get a sense of humor, or else stop disrespecting the female readers on this site. Ok, simmer down now. No one meant to disrespect anyone, I’m sure of it. I’m with #7. I loves me some baldies! 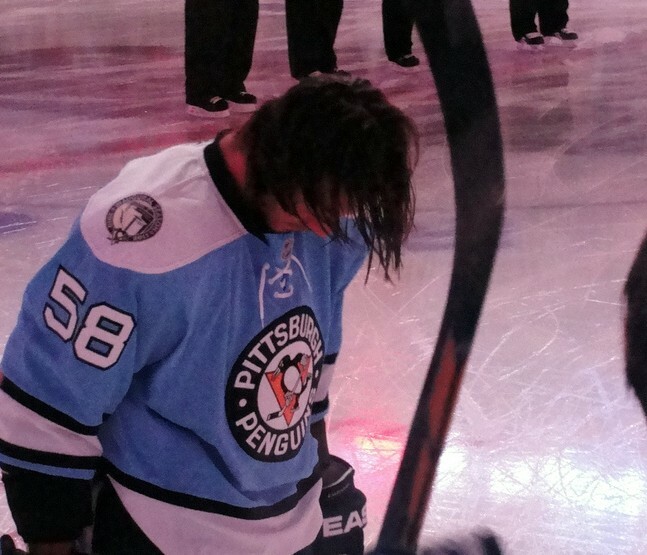 But there’s something about that sexhair of Letang’s that just makes me drool…I’d break my baldies-only rule for him. I think I made my point quite clearly. Perhaps you should get a sense of humor, as my comment obviously hit a little close to home (literally) for you. Also, save the lectures for your kids. Its a blog? does it really matter?